Are Gluten-Free Foods Making Your Child’s Tummy Troubles Worse? New Research Says Yes. A recent study published in The Journal of Pediatrics revealed that children with a common GI condition, irritable bowel syndrome (IBS), may be inadvertently eating and drinking foods and beverages that are gluten-free and supposedly more GI-friendly, but the choices are actually making their tummy troubles worse. Sometimes referred to as spastic colon or colitis, IBS affects up to 20 percent of children (as well as adults). For comparison, celiac disease, which requires the avoidance of gluten, afflicts just one percent of the population. IBS is a functional gastrointestinal condition that is diagnosed by its symptoms which include gas, bloating, diarrhea and/or constipation several times a month or week. 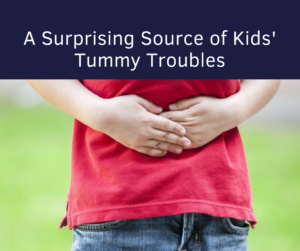 It’s unclear what causes IBS, but when children (or adults with IBS) eat foods rich in short-chain, fermentable carbohydrates, called FODMAPs, it may trigger their annoying troublesome stomach issues. This is why gastroenterologists recommend a low-FODMAP diet for anyone with IBS. Parents with children who have stomach issues often mistakenly believe the problem stems from wheat or gluten. However, this study shows that many gluten-free foods and beverages are actually high in FODMAPs and may trigger IBS symptoms in susceptible children. The researchers analyzed foods and beverages from gluten-free breads and snacks; fruit drinks and gluten-free cereal and dairy alternatives to see if the foods and beverages had high or low-FODMAP content. Results? Many gluten-free foods and beverages were high in FODMAPs, including certain gluten-free breads and muffins; lemonade, Snapple and cranberry juice; pretzels, potato chips and oven-baked French fries; and Rice Chex cereal. Due to the high prevalence of IBS among the U.S. population, the authors recommend that food manufacturers provide specific FODMAP content on their products so that those who are on a low-FODMAP diet can make informed food choices. Some companies, like Rachel Pauls Food, are creating and marketing low-FODMAP foods and supplements. A big thanks to Rachel Pauls Food, makers of low-FODMAP Happy Bars and Happy Jerky, for sponsoring this post.